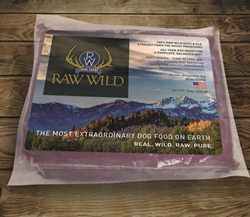 Raw Wild Introduces the Only Real, Raw, Fair-Chase Elk and Deer Meat Raw Dog Food from the Wild. New, Made-in-USA, Prey-Model Raw Dog Food Begins Shipping in March, 2016. Raw Wild, The Most Extraordinary Dog Food on Earth. Period. Raw Wild raw dog food offers an authentic wild prey diet and highest-quality protein source because it is made of raw fair-chase elk and deer meat from wild game animals of the Rocky Mountain wilderness. Today, Raw Wild, LLC announced the launch of a new brand of raw dog food. Raw Wild raw dog food offers an authentic wild prey diet and highest-quality protein source because it is made of raw fair-chase elk and deer meat from wild game animals of the Rocky Mountain wilderness. Raw dog food is a fast-growing niche in the dog food market, with discriminating dog owners seeking to mimic the high-quality protein, less fat ancestral diet that wolves and dogs have been eating for millennia. Raw Wild is as close as you can get to the sought-after ancestral diet because it is comprised of real prey animals, born and raised in the wild, not “fattened up” or fed anything by man. These wild elk and deer chose their own natural foods from those available to them in the Rocky Mountain wilderness. Because of this Raw Wild offers more calories from protein and fewer from fat, plus higher mineral content and more anti-oxidants. No antibiotics administered or added. No grains, rice or corn (gluten free dog food). No animal by-products (such as organs, hooves, ears and tails). No farmed or ranched animals. No domestically or commercially-raised animals. No downed animals (euthanized, roadkill or found dead). Added brother Dave, “In addition to all the benefits of Raw Wild from your dog’s health and vitality to being environmentally friendly because there is no farming or ranching involved, we think the big appeal for some people is going to be what we call ‘the Poop Factor.’ Raw Wild dogs typically expel a small handful of small, firm pellets twice a day. If I was walking my dog on Fifth Avenue at dawn every day, that would get my attention." Unlike most dog food companies which offer a myriad of flavors, recipes, varieties and sizes, Raw Wild is available in one recipe only called “Raw Wild” consisting of raw, wild, frozen, ground elk and deer meat. Raw Wild is offered in one-pound packages only, vacuum-sealed and flash-frozen. The only variation is how many packages you want to order at a time: 12, 24 or 48 packages at a time. Raw Wild is available for purchase exclusively through Raw Wild, LLC. Orders may be placed online through the company’s web site, http://www.rawwild.dog or by calling 1-844-RAW-WILD (729-9453). Orders are accepted by autoship subscription only. Buyers select among the three shipping sizes (12, 24 or 48 pounds), and select a shipping interval of every 2 weeks, 4 weeks or 8 weeks. Free overnight FedEx Priority Overnight Service is provided at no additional cost for all orders shipping within the Continental United States. Raw Wild Dog Food is a complete and balanced diet formulated to meet the nutritional levels established by the AAFCO Dog Food Nutrient Profiles for all life stages, including growth of large size dogs (70 lbs. or more as an adult.) AAFCO is the Association of American Feed Control Officials, which is an association of local, state and federal agencies charged by law to regulate the sale and distribution of animal feeds. Every package of Raw Wild is 99.4% raw wild elk and deer from the Rocky Mountain region of the western United States. The remaining 0.6% is a proprietary pre-mix of nutritional supplements added to the meat to allow dogs to enjoy an exclusive diet of only Raw Wild Dog Food.